Not your typical travel app | Best Road Trip Ever! Not your typical travel app! 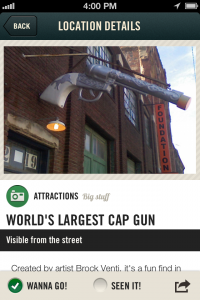 “Best Road Trip Ever!” is a location-based travel app that features almost 10,000 offbeat attractions, folk art sites, sights, and eateries across the country in one handy app. Where are you? What’s nearby? 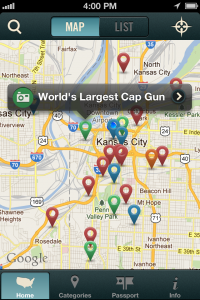 Easily pinpoint your exact location on the road, check out what’s nearby with thousands of photos and tons of stories. Perfect for anyone who loves to get in the car and explore! You won’t find the “typical” spots found on most travel apps – no run-of-the-mill fast food joints (unless they have a UFO or giant being on the building). 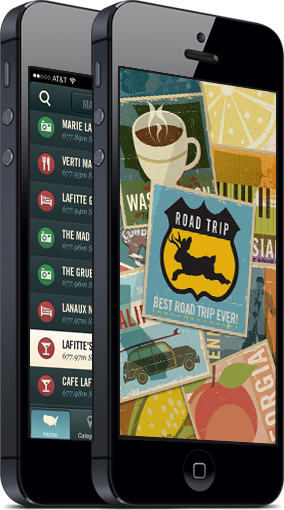 Any app can give you a phonebook listing of what’s in the area, Best Road Trip Ever gives you the hand-picked offbeat attractions that make taking the back roads a lot more fun! Roadside attractions across all 50 states. Almost 3,000 historic markers to give you a feel for the history of the area. Thousands of images – See what you are getting yourself into. Trying to decide what not to miss? Wondering what business once operated in that cool old building? Where to find a classic neon sign for the perfect photo op? Best Road Trip Ever! has it at your fingertips. The app is updated often with new info and trivia to annoy your car mates with. After you open the app, you will find yourself on the map. Just slide over to wherever you would like to start along the route. Zoom in, touch the color-coded icon and find out more about whatever tickles your fancy. Not interested in foraging for food or seeing roadside attractions? You can also customize the screen to show only the categories you are interested in finding. 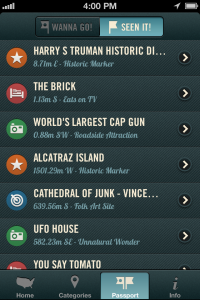 Just pinch to navigate the map, swipe to scroll through the listings, flick to see more photos. Tap any point to get more detail. Maps? Listings? Attractions? Choose your way to search through the tons of geo-coded points of interest (POIs). Every listing is text-searchable, or you can pick a location and see what is around. Requires iOS 7.0 or later for iPhones, iPod Touches, and iPads.